We have been keeping Beamer well fed and are providing some exercise. Beamer cannot get up on his own. He can raise up on his front legs, but is unable to stand on his rear legs. So, for now, that is one of our jobs. We get him up and he will walk, albeit with great difficulty, just a few steps before he tires. He is very weak in the hindquarter. 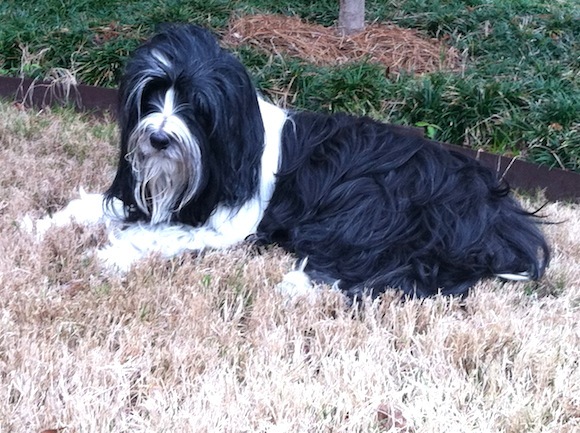 A very close friend and neighbor, Anne, called last Thursday to discuss a therapy option for Beamer. Her sister, Anita, was visiting from Canada to teach the local chiropractic university on the use of low level lasers to treat partial paralysis. Our friend had mentioned Beamer’s partial paralysis to her sister. Apparently, in Canada, vaccine reactions and partial paralysis from that reaction is a well known side effect and they use low level laser in their protocols for treatment. This therapy stimulates the body’s cells to help rejuvenate and heal. Anita spoke to the proper people to receive permission to treat Beamer and we made arrangements for the procedure to be done at our home for four days in a row. The feeling was that if there was going to be benefit from the treatment it would occur quickly. 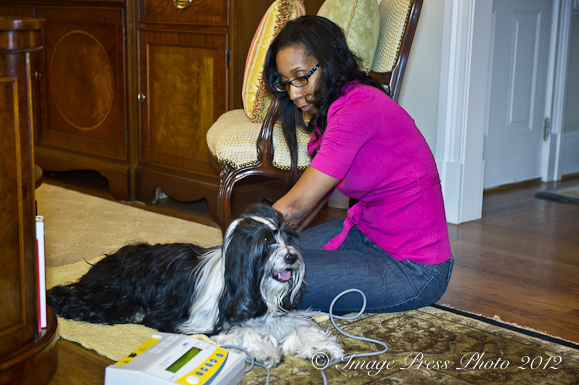 Dr. Stiles, a graduate of Life University, visited our house and administered the treatment. Beamer seemed to adjust to it quite well. He was relaxed and nodded off during the brief session. After the first treatment Beamer seemed incredibly tired. For much of the day he was very lethargic. We were worried that this therapy may have been too hard on him, but later in the day he bounced back and was sitting up and alert. The second treatment went well. Beamer was quite content to take a nap while everyone fussed over him. He was alert and energized after the treatment. The third day we noticed a slight difference in Beamer’s walking. It was marginally improved. Of course, Beamer is on Prednisone which can also improve his symptoms. Beamer had his fourth and final laser treatment yesterday. That was also the day that we meet with Dr. Susan Wynn to discuss alternative medicines and therapies from our referral by Dr. Jean Dodds (as mentioned in the last update). Our visit was different than expected. Dr. Wynn agreed that this was a classic case of Vaccinosis. Rather than giving him homeopathic remedies to detox him, she was very much in favor of keeping Beamer on Prednisone since it seemed to turn his condition around. In fact, she increased his dosage. We were in the process of weaning him back, at the suggestion of the other vets. He is now on 5 mg twice a day for two weeks and then we will begin to taper the dosage back over the following three weeks. Dr. Wynn said that if we were not using Prednisone she would use Thuja and Lyssin for detox, but since Prednisone is working we should stay with it. These two detox remedies do not work when taking Prednisone. Dr. Wynn added an adult Centrum vitamin to his diet to replenish necessary vitamins and minerals that he has lost through his lack of eating and a finicky palate. In addition, we are starting him on Chinese supplements twice a day. This includes a mixture of Hindquarter Weakness (70%) and Xiao Huo Luo Dan (30%). I will be adding that to his diet this evening. Beamer seems to be making progress. He is eating well, but still needs to gain back his strength. We can’t say for sure, but we believe that Beamer has a smile on his face again. 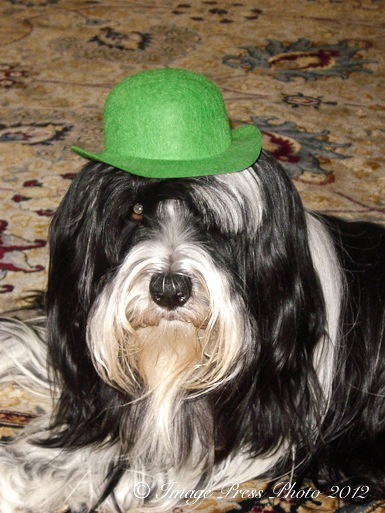 Tibetan Terriers are known as “The Little People” because of their personalities. Beamer’s name was given to him because of his beautiful smile. Tomorrow is his first hydrotherapy appointment. We are hoping this will be the start of a strengthening program and exercise to regain his mobility. His legs and hips are very weak, so we know this will take some time. It was a little less than a week ago that we thought we were going to lose our best buddy. Now, Beamer has turned the corner and we are very encouraged. Physical therapy and the continued use of Prednisone and supplements are on this week’s agenda. Keep us in your thoughts and prayers and we will have another update later this week or early next week. So happy to hear about Beamer feeling better and it seems like the whole family feels relieved with this new plan. Here’s to a great week of therapy and hugs. Great News!!! Tears in my eyes..lump in my throat. It is obvious how much you love Beamer! Fantastic—so glad to hear he seems to be turning the corner and feeling better at last! I can’t imagine the stress you have been under being so worried about Beamer for this length of time, when you couldn’t seem to get any definite answers about what was wrong with him and how to help him get better. Positive thoughts headed your way for his recovery! So happy to read this update and to see that Beamer is improving! Still, and always, wishing you all the best possible outcome. Yay!! Great news! And I am sure the hydrotherapy will be a good thing! Wishing Beamer all the best! Wonderful news! This comes with lots of good wishes for Beamer’s continued healing and strength, 1 day at a time, and some R&R for you all in the coming weeks. Such wonderful news to hear that things are beginning to turn around. I’m very happy for the Bunkycooks family and will keep all in my thoughts and prayers. Such good news! So glad to hear. I’m sure you and Mr. B. are more than relieved to see some change for the better. Sending you all, especially Beamer, loads of happy thoughts and prayers for healing. I’m hesitant to ask, but we haven’t heard from Beamer in quite some time… how’s he doing? Thank you for checking in. Beamer is actually doing much better and is improving daily. We have been so busy with his care and my other website that we are way behind on updates. We will have a very lengthy one out soon to bring everyone up to date. Your pet’s paralysis may be more than a reaction. Check out these medical articles: http://www.traveldoctoronline.net/rabies-induced-in-a-cat-by-high-egg-passage-flury-strain-vaccine-MTIwMDI1OTM=.htm. It may be time to do some in-depth research on the rabies vaccine your dog received, i.e., rabies strain, culture medium, adjuvants, preservatives, manufacturer, batch number, etc. Perhaps consider testing as in this case. Because my cat has permanent behavioral changes that developed after her first rabies vaccine, I called Dr. Don Hamilton, DVM, homeopath. He recommends a homeopathic remedy derived from the vaccine itself. Makes sense when you consider the toxic soup these vaccines are. I am very sorry to hear about your cat. I know that this whole subject of vaccines is really a difficult one to address. It is the law to vaccinate for many things, but at what risk to our pets? We did have the same lot vaccine checked for live rabies virus and it came back negative. I know they took the sample through other tests as well, but I am not sure what they were looking for. It has been 6 months since the shot, so I don’t think we could even get a vile of the original booster. Beamer has recovered about 80%, although he has suffered nerve and muscle damage. His legs shake and quiver, but for the most part, we have our dog back. Beamer is such a beautiful dog! I am so happy that he has responded to well to his medication and I pray that his therapy works wonders for him. I will keep you and Beamer in my thoughts and I hope for additional improvements in his health and mobility. There is nothing like a dog. May Beamer be with you and your family for a good loooong time!! !